Monday night was the red carpet premiere of Avengers: Age of Ultron in Hollywood. It was a long night for the stars as they also sat down with Jimmy Kimmel on Jimmy Kimmel Live for some late night shenanigans. 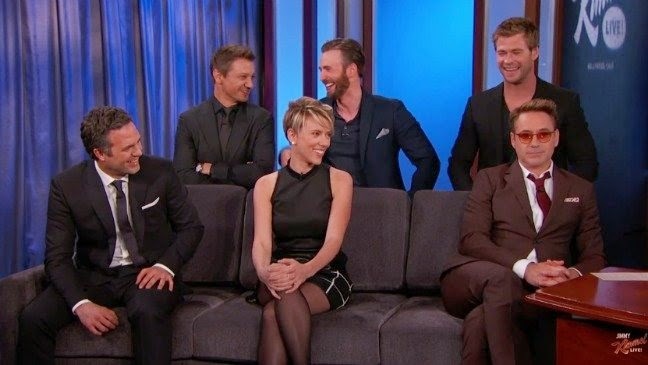 Robert Downey Jr., Scarlett Johansson, Chris Hemsworth, Chris Evans, Mark Ruffalo and Jeremy Renner participated in a game of telephone, played a version of 'Family Feud' and debuted an exclusive clip as well. Check out the playlist below for all the clips from the broadcast.